In a Nutshell: Since the early 20th century, the automobile has shaped life in America — but it’s not always been for the better. The Institute for Transportation Development and Policy seeks to solve car-related urban problems, like gridlock and smog, by guiding the redevelopment of transit infrastructure. For cities, this means decreased car traffic and larger investments in public transportation; for residents, this means cleaner air, better access to urban areas, and the resulting financial benefits associated with more affordable transportation. ITDP has already experienced success in its endeavors around the world, including places like Mexico City and Guangzhou, China. As US cities continue to grow, ITDP works to reconcile the car-centric ideals of yesterday with sustainable transit solutions for tomorrow. In 1908, the first Ford Model T rolled off the assembly line and into the history books. An American dream was born: the freedom of the open road, accessible to all Americans. It wasn’t until after World War II that Ford’s dream truly came to fruition. The US economy changed gears to peacetime manufacturing, and cars flooded the market. This wide availability coincided with the post-war baby boom, which spurred residential suburban expansion away from crowded city centers; and low-interest veterans loans that made homeownership financially possible for many Americans. The car provided freedom of movement to these new homeowners, who were able to work in the city but live in the more comfortable suburbs. At the same time, the Interstate Highway System gave people easy access to wider travel, and the ubiquity of cars gave teens an independence from home life that created the notorious generation gap. The car has been a major force in shaping the physical and cultural landscape of the United States. And through it all, Americans have clung to the ideal that cars mean freedom — even though motorists spend so much time sitting in traffic, sitting in the lobby of the mechanic’s shop, and sitting in line at the DMV. As much as cars grant people freedom, they restrict the idea of what freedom and mobility mean. “People are starting to understand cars can provide freedom, but they also provide a lot of restrictions,” said Jemilah Magnusson, Global Communications Director at the Institute for Transportation and Development Policy (ITDP). “They’re expensive, and they require you to drive all the time, to deal with traffic, to restrict your movements to places where you can drive,” she continued. ITDP’s purpose is to situate transit as a central factor in economic opportunity, environmental concern, and public health and safety. “Our focus has really been on how we can move people around cities in the most efficient way that will be good for the city, improve quality of life, and, of course, help the environment,” Magnusson said. The institute’s goal is to renovate our understanding of transportation and, in so doing, renovate our cities and the way we live in them. ITDP’s approach involves introducing and improving public transit, but for these measures to succeed, cities must shift their focus away from urban sprawl and car-dependent layouts. Instead of accommodating the use of cars, developments and transit must focus on getting people where they need to go in the most efficient, sustainable ways possible. ITDP’s efforts are guided by eight principles. The first two are to prioritize walking and cycling: ensuring there is a safe, complete infrastructure for each and ample, secure storage for bicycles. Walking and biking routes must be dense and interconnected, making them easier and faster to navigate than roadways. These routes must also provide easy access to public transportation. Part of this behavioral shift involves making it desirable not to drive. ITDP advocates travel demand management strategies that make walking, cycling, and public transportation more inviting than using a car. One strategy is congestion pricing, which charges a fee to drive personal or commercial vehicles in certain metropolitan areas. Another is parking policy reform that, instead of accommodating car access, regulates it and shifts the cost of driving and parking infrastructure to the car’s operator. The counterpart to this, of course, is improving infrastructure for walking, cycling, and buses. ITDP also advocates for the use of bus rapid transit (BRT) systems as a way for public transit to keep pace with urban development. “This is something that cities can do with the roads at a modest budget in a very short period of time to really add serious mass, rapid transit,” Magnusson said. BRT systems are an affordable alternative for cities looking to improve public transportation. BRTs combine the efficiency and quality of metro systems with the flexibility and cost-effectiveness of buses. Dedicated lanes allow BRT vehicles to move rapidly through the city, avoiding mixed-traffic congestion. Riders pay at the station — not on the bus — which substantially reduces embarkation time. And, because BRT stations are at ground level, they’re accessible to everyone, which is good news for people who have difficulty navigating subway station stairs. Anyone who’s ever sat in gridlocked traffic should agree that improving transit efficiency is a worthwhile goal, in itself. But, in addition to the obvious benefits, transit-oriented development offers city dwellers opportunity for an overall improved quality of life. Beyond easing congestion, ITDP’s approach emphasizes the benefits urban residents can reap from transit improvements. Not least among these are health and improved financial well-being. The ability to cycle and walk quickly around a city creates more opportunity for residents in lower socioeconomic classes. In this scenario, since having a car isn’t a determiner in landing work, people become more competitive for jobs. As an added financial benefit, the money that people would otherwise put into obtaining and maintaining a car for commuting can be put to better use elsewhere in their budgets. Fewer cars on the road and fuel-efficient buses moving more expeditiously through the streets means better air quality for residents. Fewer pollutants promise better health for residents, as does the exercise incurred through cycling and walking. This is good for people, and great for the environment; a decrease in motor vehicles also means less carbon dioxide released into the atmosphere. “With a really small investment in something like a bike-share system or a correct, protected infrastructure, you can reduce your carbon output very dramatically in a very short amount of time,” Magnusson said. Transit-oriented development also makes it easier for people to be active their communities. Efficient transit infrastructure offers better access to cultural and natural spaces, institutions, and other unique sites that give each neighborhood its unique character. Although ITDP has offices and projects in nations around the world, two of its standout achievements are in Mexico City and Guangzhou, China. These cities have successfully implemented ITDP’s development strategies to the benefit of their citizens and economies. Mexico City maintains BRT service along three corridors and operates a bike-sharing system with more than 6,800 bikes and 480 stations with plans to add e-bikes, with 28 additional stations and 350 e-bikes. The city has also restricted automobile access to certain areas. Magnusson said several Chinese cities have rapidly gone from having no transit system to having high-capacity transport. “Guangzhou, China, is probably the most dramatic example,” she said. 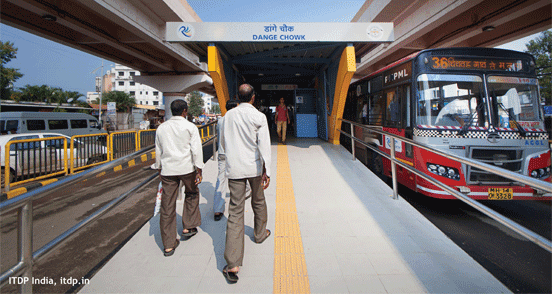 ITDP helped Guangzhou develop its new transit system, which now features robust BRT. The Guangzhou line moves more than 850,000 people each day on 350 buses traversing a central corridor through the city. This BRT was Asia’s first gold-standard system and has been recognized with the 2011 Sustainable Transport Award and a 2012 UN Lighthouse Project award, among other accolades. In addition to its BRT system, Guangzhou also has one of the world’s largest and most successful bike-sharing programs, which is helping to keep more cars off the road. Guangzhou’s multi-modal transit infrastructure also has a greenway and several public spaces along its length. As a result of the city’s transportation and scenic improvements, land values along the corridor rose 30% higher than the Tianhe District average. Transit-oriented development has obvious advantages for cities and their residents. And urbanites in the US can take heart: ITDP is already on the case of some of America’s most vexing transit situations. Stateside, ITDP is currently looking at projects in Dallas and Houston, Texas. According to the United Nations, 54% of the world’s population was living in urban areas as of 2014. And the US Census Bureau reports that 80.7% of Americans were living in cities as of 2010. One thing is clear: as more people move to cities, congestion will become a larger problem. The livability of cities — in terms of transit, opportunity, and quality of life — depends on investment in transit by government and citizens. Luckily, ITDP is on board to help reconcile the car-oriented dreams of the past with a better, more sustainable vision of the future.